The apparent imminent demise of the 18-month-old M23 rebellion is unlikely, on its own, to deliver peace to the east of the Democratic Republic of Congo (DRC), where, in the absence of a significant presence of the state, at least 40 armed groups operate, and a chronic humanitarian crisis persists. 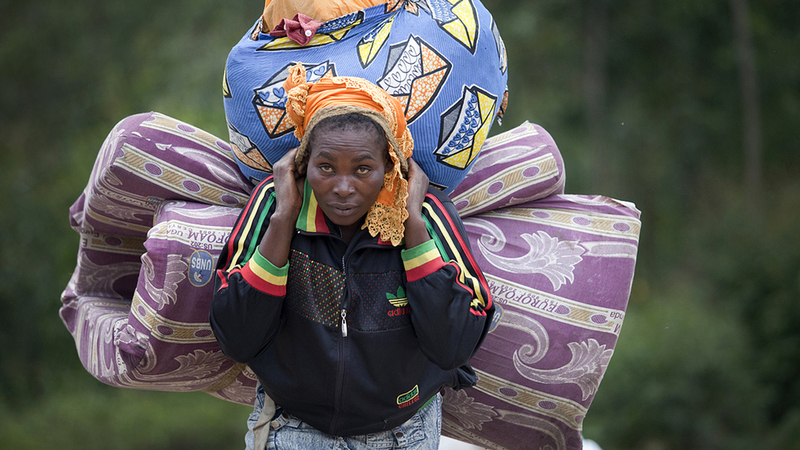 Some 2.6 million people are displaced and 6.4 million in need of emergency food aid in eastern DRC. "One of the predictors of where a new insurgency will emerge in the DRC is to look for past movements: armed groups beget armed groups, as commanders take advantage of networks of former combatants and rekindle relations with smugglers, arms dealers and miners"
“The complexity of the war in eastern Congo, with its entangled web of actors pursuing a multiplicity of agendas can be overwhelming and confusing. The region is a fertile environment for the development and growth of armed groups and warlordism,” according to the Enough Project. “One of the predictors of where a new insurgency will emerge in the DRC is to look for past movements: armed groups beget armed groups, as commanders take advantage of networks of former combatants and rekindle relations with smugglers, arms dealers and miners,” says an Usalama Project report. The M23 rebel group came into existence in April 2012 when hundreds of mainly ethnic Tutsi soldiers in FARDC (the Congolese army), led by Gen Bosco Ntaganda, mutinied over poor living conditions and pay. Most of the mutineers were previously members of the pro-Tutsi Congrès national pour la défense du peuple (CNDP). In 2009 CNDP signed a deal with the government which the mutineers felt Kinshasa did not fully implement. M23 takes its name from the 23 March 2009 CNDP-DRC government peace treaty. Fighting between M23 and FARDC has displaced hundreds of thousands in North Kivu and forced tens of thousands to flee across the border to Rwanda and Uganda. Both sides have been accused of gross human rights abuses against each other and civilians, some of which amount to war crimes, according to rights groups. In December 2012, M23 briefly occupied the North Kivu provincial capital of Goma. “Officially, M23 wants better governance, security, democratization and development of the country. Lately, they publicly demanded amnesty, military as well as political reintegration,” says the Enough Project report. According to the Enough Project, M23 troops are estimated to number 1,500. Other sources put their number at 1,700-2,000. “An injection of fresh [UN] peacekeepers earlier this year with a stronger mandate to actively take the fight to the [M23] rebels appears to have turned the tide,” says BBC correspondent Gabriel Gatehouse. The FDLR was founded by some of the key perpetrators of the 1994 genocide in Rwanda, who fled across the border into eastern DRC in the wake of those massacres. It is led by Maj-Gen Sylvestre Mudacumura, who has been indicted for war crimes by the International Criminal Court (ICC). “FDLR suffers from internal divisions and a weak hierarchy that lacks the capability to command and control the organization’s entire operations,” says Vogel. According to the 2013 Midterm Report by the UN Group of Experts (GoE), FDLR, estimated to be 1,500-strong, grew weaker in the first half of 2013, with the decrease in numbers attributed to a high surrender rate. FDLR’s leadership is divided between hardliners such as Mudacumura, who wants to continue the armed struggle, and moderates from a younger generation who favour demobilization and reintegration, according to the GoE report. The group continues to be implicated in human rights violations and the illicit exploitation of natural resources over the last 15-20 years. FDLR remains active in parts of Masisi, Walikale, Southern Lubero and Rutshuru territories. The group, led by Brig-Gen Jean Damascène Ntibabagije (“Musare”), comprises 400-600 mostly ethnic Hutus. It has non-aggression pacts with several groups and tolerates M23, according to Enough Project’s August report. The group operates around South Lubero Territory with extended positions in northeastern Rutshuru Territory and is involved in the mineral, timber and coal trade, and also engages in illegal taxation and poaching. The FDLR/SOKI group, whose leader “Colonel” Soki was killed by M23 in July, has 60-100 mostly Hutu men. According to Enough Project, the group is noted for its banditry activities in northern Rutshuru Territory, North Kivu. This 1,500-5,000-strong faction led by Maj-Gen Mudacumura includes some 1994 Rwanda génocidaires, according to the Enough Project. It is active in western Rutshuru Territory, and has been accused of human rights violations and the illicit exploitation of natural resources. Its enemies include the M23. Led by “Colonel” Mandevu, the group, which split form FDLR/FOCA in 2010, reportedly joined M23 and is opposed to FARDC. An M23 ally, URDC is led by “Brigadier General” Paluku Kombi Hilaire, a FARDC defector. It was formed in 2012. It comprises about 300 men, mostly from the Nande ethnic community. URDC’s other alliances are with Uganda’s Allied Democratic Forces (ADF) and Maï Maï Morgan (see below), according to the Enough Project. URDC represents politicians and business people opposed to the central government, according to the GoE report, which notes that the URDC operates in Beni Territory, North Kivu. The group is said to have been kidnapping children and adults in Beni since the beginning of 2013. Escapees and former abductees told the GoE that some of them had undergone military training, while others had been used for forced labour. URDC obtains weapons and ammunition from FARDC (by purchasing or attacking and looting army positions); from M23; and from smugglers from Uganda, says the GoE report. Another M23 collaborator, Raia Mutomboki, (“outraged citizens”) is the largest armed body in South Kivu, according to Usalama Project. Raia Mutomboki, established in 2005 in South Kivu’s Shabunda Territory by Congolese army defector Pastor Jean Musumbu in response to FDLR massacres, comprises various groups headed by local leaders and FARDC deserters. It evolved from a parochial militia into a violent franchise deployed across large parts of North and South Kivu amid flaws in the various peace deals in eastern DRC, says the Usalama report. “Raia Mutomboki is first and foremost a reaction to the presence of former Interahamwe group FDLR which has wreaked havoc across wide parts of eastern Congo. 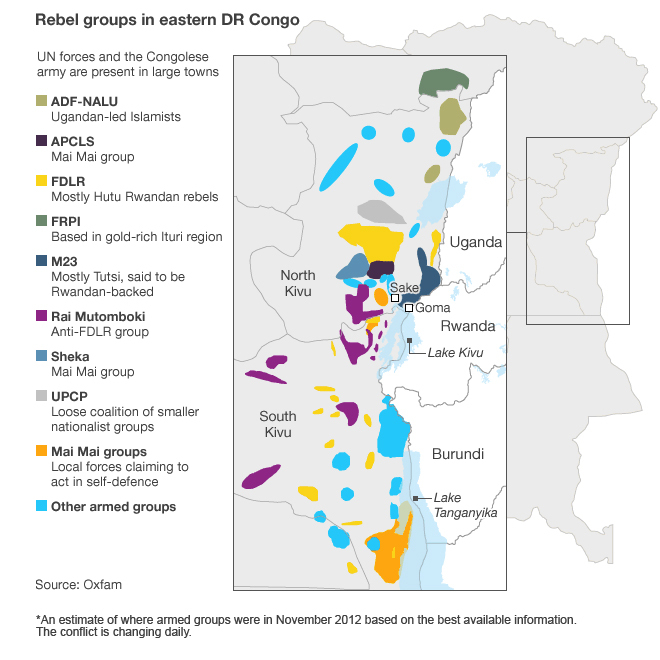 [They] function on the basis of localized self-defence militias that have tried to counter the FDLR threat as violently as possible, including [through] serious human rights violations such as arbitrary killings, attacks against unarmed dependants, or executions,” Christoph Vogel, a Mercator fellow and DRC analyst, told IRIN. Since 2011, Raia Mutomboki has rapidly developed in the Kivus, according to the GoE report. In March 2013, a Raia Mutomboki commander in Shabunda, Mutuza Kasapa, told the GoE that the militia would not cease hostilities as long as there are Rwandophones in the Kivus. The GoE report documented M23 support for some Raia Mutomboki groups in North Kivu’s southern Masisi Territory. The UN stabilization mission in the DRC (MONUSCO) in late October condemned attacks by Maï Maï Sheka (sometimes in collaboration with Raia Mutomboki) in parts of North Kivu’s Masisi Territory that left tens dead, including children. Formed in 2009 by long-time minerals businessman Ntabo Ntaberi Sheka in North Kivu’s Walikale Territory, Maï Maï Sheka has 150-180 men, mainly army deserters and youths, according to the Enough Project. “General” Sheka has in the past allied himself with ex-CNDP (subsequently M23 leader) Gen Bosco Ntaganda, who is currently at the ICC. The UN in 2011 designated Sheka for targeted sanctions. Its fighters are drawn mainly from the Batembo, Bahunde and Bayanga communities and it is active in southern Masisi Territory (North Kivu). The group claims to be protecting “indigenous” interests from purportedly foreign Rwandophone groups. During the 1998-2003 civil war it fought the Rwandan-backed Rassemblement Congolais pour la Democratie rebellion, and its successor CNDP, and has fought against RCD-Goma (ruled North Kivu as a proxy of the Rwandan government from 1998-2003) and CNDP in the past, according to an April Small Arms Survey report. Erasto Ntibaturama, an influential ethnic Hutu figure in northern Masisi (North Kivu), established LDF, which has over 50 mainly Hutu men, in 2005, according to the Enough Project, which says the group is reportedly allied to M23. Ntibaturama, it adds, reportedly helps ex-CNDP combatants grab land and expand M23’s influence in Masisi. According to the GoE report, Ntibaturama sent his son to support M23. Originally a local defence force against the FDLR and FARDC, FDC was established in 2012 under the overall command of “General” Butu Luanda, a former CNDP officer. FDC took part in several critical operations against the FDLR leadership in the areas surrounding Ntoto and Kimua in January and February 2012, according to the GoE report, which noted that Luanda worked closely with M23’s Ntaganda, who supplied him with financial support, weapons and ammunition. Established in 2012, UPCP is a coalition of Maï Maï groups and FARDC defectors led by “General” Kakule Vasaka Sikulikyolo Lafontaine. It comprises 500-600 mostly ethnic Nande men and is active around North Kivu’s Lubero Territory, according to the Enough Project, which adds that UPCP is aiming to form a coalition of armed groups to topple the DRC government. UPCP, adds the Enough Project, has helped ex-CNDP officers to defect from the national army which it views as its main enemy. The group is notorious for mining gold in Southern Lubero along with FDLR/RUD. MAC, whose aim is countering M23’s advance into Masisi, was formed by a faction of local guides and porters, who fell out with Ntaganda (after his mutiny from FARDC to form M23), according to the Enough Project report. It is led Lt-Col Bwira, a former FARDC commander from the Hunde community and has 80-300 mostly ethnic Hunde and Nyanga men. It collaborates with other armed groups such as APCLS, FARDC and Nyatura. MAP comprises a group of 500 mainly ethnic Hutu FARDC defectors, who left the army in 2011 over perceived marginalization by ex-CNDP officers. It is led by Col Ndagijimana Basabose and claims to protect Hutu interests against ex-CNDP officers and M23 operations in Rutshuru Territory. It has links with several armed groups, according to the Enough Project. Maï Maï Morgan is led by Paul Sadala, alias Morgan, and operates in Orientale Province’s Mambasa and Bafwasende territories. It comprises several dozen combatants, who operate in small groups out of shifting camps, according to the UN report. Morgan frequently boosts his ranks with Hilaire’s URDC (see above) and Maï Maï Simba (see below) allies as well as recruits from Kisangani, adds the report. Morgan’s troops have been blamed for atrocities ranging from abductions, to cannibalism and sexual slavery during raids on villages and mines. Former captives told the GoE that on several occasions Morgan’s group had engaged in cannibalism and killed or injured people by setting them on fire. Morgan is a long-time poacher of elephants in and around the Okapi Wildlife Reserve, adds the GoE report. FARDC attacks have caused Morgan’s group to fragment into small armed criminal bands. Said to be the oldest Congolese armed group with origins dating back to 1964, according the Enough Project, Maï Maï Simba (also known as “Armée Populaire de Libération Nationale Congolaise-Lumumba - APLNC/Lumumba) is led by “General” Mando Mazero and “General” Lucien Simba. Comprising 150-200 men, it operates in Maniema and Orientale provinces and has collaborated with FARDC, Maï Maï Morgan, Raïa Mutomboki and Sheka/NDC elements, according to the Enough Project, which notes that the group’s objective is remodelling DRC according to first President Patrice Lubumba’s political views on unification. The ADF is a Ugandan-led Islamist rebel group operating northwest of the Rwenzori Mountains around DRC’s Beni Territory. Its supreme leader, Jamil Mukulu, a Christian turned Muslim, founded ADF in 1995 with a view to establishing an Islamic state in Uganda. It is among the oldest but least known groups in eastern DRC and has about 1,200 combatants. The group attempted to increase its numbers through recruitment and kidnappings in early 2013 in Uganda, according to the GoE report, which noted that ADF has recruited in the DRC in 2013 and carried out a series of abductions of Congolese nationals. In July, ADF-FARDC troops clashed around the area of Kamango, in the northernmost part of North Kivu causing thousands of people to flee into Uganda. "The ADF has links with Al-Qaeda, who have links with Al-Shabab"
UN experts are examining ADF’s potential links with the Somali militant group Al-Shabab. Reports of such connections have led to fears of an anti-Muslim backlash in Beni. “The ADF has links with Al-Qaeda, who have links with Al-Shabab. They have been trained on improvised explosive devises,” Uganda army spokesman Lt-Col Paddy Ankunda told IRIN. The group has 800-1200 mostly Nande men. The LRA was founded in northern Uganda in 1987 and is led by ICC indictee Joseph Kony. It gained infamy for its brutality and forced recruitment of thousands of children. It has was last active in Uganda since 2006, and now operates, with just a few hundred fighters, in northern DRC, South Sudan and the Central African Republic, where some 353,000 people are displaced for fear of attack by the LRA. IRIN’s archives contain hundreds of articles about the LRA. The FNL is now chiefly a Burundian opposition political party. Armed remnants of its former incarnation as a rebel group continue to operate in the areas of Magunda and Ruhuha, in South Kivu’s Uvira plateau. Formerly led by Agathon Rwasa, FNL is now headed by Isidore Nibizi with “General” Aloys Nzamapema as the military commander. However, since the start of 2013, FNL has remained divided and weakened, according to the UN report, which notes that FNL conducted raids in DRC and Burundi to forcibly recruit young people and obtain food supplies. At the end of January 2013 FNL and FDLR (see above) troops joined forces to fight an armed group (the GoE report does not identify it) in the area of Masango, South Kivu. Houses and schools were burned. According to Bukavu university researcher Musamba, the FNL issue needs to be addressed internally in Burundi and regionally within the context of the International Conference on the Great Lakes Region (ICGLR). The Congo Siasa blog notes that Maï Maï Yakutumba is an important group in South Kivu, especially Fizi Territory. Founded in 2007, Maï-Maï Yakutumba is named after its military leader “Major-General” William Amuri Yakutumba. Its political wing, Parti pour l’Action et la Reconstruction du Congo (PARC), is led by Raphael Looba Undji. Yakutumba and Undji are both university-educated intellectuals, according to the Congo Siasa blog. "The Yakutumba-FNL collaboration indicates the extent to which violence in the DRC continues to be influenced by regional dynamics and is fed by trans-border militarized networks"
“The Yakutumba-FNL collaboration indicates the extent to which violence in the DRC continues to be influenced by regional dynamics and is fed by trans-border militarized networks,” she noted. According to the Usalama project report, both Yakutumba and the FNL recruited among Congolese and Burundian refugees in Tanzania. “Founded in 2010, Maï Maï Nyatura is a Congolese Hutu militia which collaborates with FDLR and FARDC against M23. “The group claims to protect Hutu interests against ex-CNDP officers and M23,” said the Enough Project. “Nyatura is engaged in confrontations both as a standalone group but also with some subgroups having been employed as proxy forces by the Congolese army,” says Vogel. Maï Maï Nyatura has been accused (as have M23 and FDLR) of human rights violations, including the recruitment of child soldiers. In 2012, some Nyatura forces were integrated into FARDC. Nyatura has recently been engaged in fighting with APCLS in Masisi and has in the past attacked M23 convoys. FDIPC’s aim was to expel M23 from Rutshuru Territory (captured by government forces on 27 October). It was formed in April 2013, according to the Enough Project, which adds that the group has about 250 Mainly Hutu members from Rutshuru and Kiwandja. “The group has become known for staging deadly ambushes against M23’s military convoys in the rebels’ fiefdom. Civilians have been bearing the brunt of M23’s retaliatory attacks. There are currently no efforts to integrate FDIPC into the Congolese national army,” said Enough Project’s Muller. Led by FARDC deserter “General” Janvier Buingo Karayiri, APCLS was created in 2008 to confront a perceived CNDP threat against the Hunde community, according to the Enough Project. APCLS interacts with FARDC elements, FDLR/FOCA and Nyatura and has also acted as proxy for other FARDC elements against M23, says the Enough Project. The group, which has about 1,500 men, is reportedly involved in tantalum (used in mobile phones) mining in Masisi. According to the UN report, a process of integrating some APCLS rebels into FARDC in Kitchanga, Masisi, was disrupted following heavy clashes with the army in February and March. The fighting temporarily displaced around 100,000 people, with both parties committing grave human rights violations, including the targeted killings of civilians, added the GoE report. APCLS has clashed with Maï Maï Sheka. “In Masisi Territory, a variety of armed groups are highly active in the shadow of the FARDC-M23 confrontation eastwards. The recent clashes between Janvier's APCLS and Sheka's NDC have caused massive displacement and left various small towns burnt down,” Vogel told IRIN. COGAI is an umbrella organization aimed at uniting militias in Orientale Province’s Ituri District. Led by “Brigadier-General” Justin Banaloki (alias Cobra Matata), who also heads FRPI (see below), COGAI was established in May 2012, according to the Enough Project. It has some 800 members and controls parts of eastern and southern Irumu Territory in Ituri. COGAI’s first leader, Germain Katanga, is on trial at the ICC. “Matata’s COGAI destabilized Ituri during 2012 but was weakened by FARDC operations. It has failed to gain the support of the majority of the Hema community,” Enough Project’s Muller told IRIN. Part of COGAI, the FPRI is led by Cobra Matata. According to the UN report, there has been little progress in either integrating FRPI into FARDC or defeating it. FRPI wants to reach an agreement with the central government similar to the 23 March 2009 accord with CNDP and other armed groups. “The FRPI leaders say their main objectives were to be integrated into the FARDC at their current [self-proclaimed] ranks, to remain in Ituri and to have the government liberate and grant amnesty to FRPI prisoners,” Vogel, told IRIN. FRPI also continues to harass people, collects illegal taxes and engages in activities such as artisanal gold mining and looting. Kata Katanga (“cut off Katanga” in Swahili) is a loosely structured armed group comprising individuals and groups campaigning for the secession of DRC’s southeastern Katanga Province, according to the GoE report. Kyungu Mutanga (“Gédéon”)’ is Kata Katanga’s most significant leader in the areas of Manono, Mitwaba and Pweto. He is allied with the armed wing of the Coordination pour le référendum et l’autodétermination du Katanga, the report says. In late 2012 and early 2013, clashes between the group and FARDC in Katanga resulted in serious human rights violations and breaches of international humanitarian law. The violence in Katanga has been characterized by massacres, summary executions, ethnically targeted attacks, and the burning of people, homes, and property, adds the GoE report. “They [Kata Katanga] have become infamous for massive human rights violations in the so-called `murderous triangle' between Pweto, Manono, and Kalemie where they burnt down villages and [the] insignia of the Congolese state,” Vogel told IRIN. Kata Katanga claims to be recruiting new members and providing them with military training. According to Bukavu University’s Bussy, the group includes radicals involved in recruiting child soldiers in Katanga Province. Following a failed incursion into Katanga’s provincial capital of Lubumbashi in March, hundreds of the group’s fighters were rounded up, killed or detained. “Bakata Katanga [Kata Katanga] are currently in the process of integration into FARDC,” said Bussy. FDN was created by former FARDC soldiers who defected from the national army in 2010, over perceived marginalization. The 160-strong group operates in eastern Walikale Territory, according to the Enough Project, and is headed by “Colonel” Akilimali Luendo, alias Akilo, and “Colonel” Jeremie. “The group is gradually declining as some leaders have turned themselves over to the Congolese army,” said the Enough Project. Reuters reported on 28 October that about 10,000 Congolese refugees had fled into Uganda to escape fighting between a new rebel faction identified as M18 and militias in northeastern DRC. The Ugandan military says M18 is not linked to the M23 insurgency in North Kivu Province. "We know that M18 is a new rebel group in Orientale Province and they've been clashing with some militias there and forcing people to flee," Reuters quoted Uganda's military spokesman Lt-Col Paddy Ankunda as saying. M26, created on 26 October 2012, comprises veterans of Nyatura who refused integration in FARDC. Alongside two other armed groups (FDLR and a faction of the Maï Maï group Pareco) it has been trying to gain recruits in the Mpati area of North Kivu, according to Great Lakes Voice. M26 is also suspected of involvement in mass rapes in the region, according to News Afrique Informations.